THE PLAINS, Va., Jul. 06 /CSRwire/ - GreenTrees recently completed its latest verification for 1,273,866 metric tons on the American Carbon Registry (ACR). This marks the second consecutive issuance of over one million tons. The GreenTrees River System approach is setting the standard for how reforestation can achieve scale and impact and does it with small and medium-sized landowners. Reforestation provides a continuous loop of scaled impact while bending the climate curve. On behalf of our 500+ landowners ranging from 7 to 1700+ acres, the company is pleased to quantify the positive impact being made in cleaning up the air, building equity in the landscape, filtering the water and enhancing wildlife habitat. Ultimately, reforestation is about repairing past and growing future with nature’s technology —- Trees! 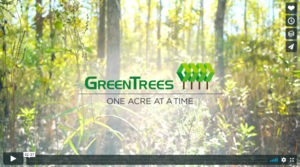 GreenTrees® is the largest reforestation program in North America with more than 120,000 acres of trees planted with its 500 landowner partners, producing over 1,000,000 tons annually on The American Carbon Registry. GreenTrees was awarded the prestigious Innovation Award in 2018 for the successful and scaled results to date. For more information please visit www.green-trees.com or contact Chandler Van Voorhis at chandler@green-trees.com or call at 540-253-2504.